Google latitude blip – I’m not in Liberia. I was sat in Frankfurt airport late on Friday evening when I fired up Google’s latitude to see where folks were. When I fired the app up, i tend to use the network location feature as opposed to GPS to preserve battery, but I had a bit of a shock when it located me in Liberia, West Africa. Apologies for the rather fuzzy pic, but I didn’t have a screenshot app installed so use the N95 to snap the E71. This entry was posted in Nokia/S60, Travel. Bookmark the permalink. 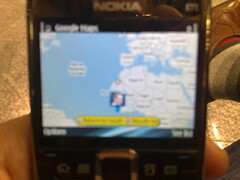 I had this using the Gmaps itself pre Latitude, it said I was in China.